Senior Master Sgt. (Ret.) 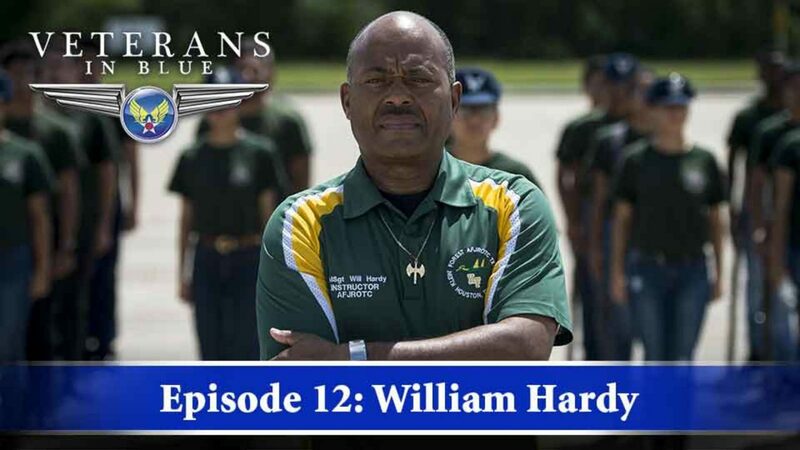 William E. Hardy is an Air Force veteran with 22 years of service. After graduating from Green Country Central High School in Snowhill, North Carolina, Hardy joined the Air Force in July 1978. While his primary Air Force Specialty was supply, he spent many years of his career on special-duty assignments that included being a first sergeant as well as serving nine years as a military training instructor. As an MTI, he earned the title of Master Military Training Instructor, an honor held by only the top 10 percent of all instructors. A highlight in Hardy’s career was being a key member in creating the Airman’s Coin ceremony at basic training. Hardy retired on Sept. 1, 2000, and transitioned to being a Junior Reserve Officer Training Corps instructor at Klein Forest High School in Houston, Texas. Hardy has been instructing JROTC for more than 16 years. Veterans in Blue is a multimedia collection showcasing men and women who have contributed to the legacy of the Air Force.